First a book, then a movie, now a workout—the Hunger Games has arrived in Philly. 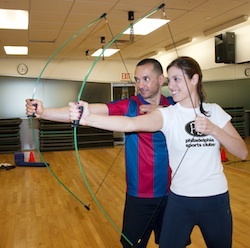 By Emily Leaman·	 3/20/2012, 1:40 p.m.
Trainer Eric Salvador demonstrates the Katniss Killers archery move with a tribute. There are two things you need to know about me before we begin. First, I am extremely competitive. You know how Monica in Friends is always trying to win at, well, everything (see: ping-pong, trivia)? That’s totally me. Ever since I began playing touch football with the boys on my street in elementary school, I’ve simply refused to lose. Or, if I do lose at something (rarely), I don’t go down without a serious fight. 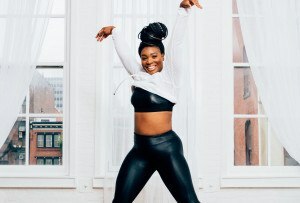 So when the folks over at Philadelphia Sports Clubs emailed me two weeks ago to see if I’d be interested in trying out a new Hunger Games-inspired workout they were concocting, I’m preeeetty sure I gasped, then yelped out loud at my computer, before replying with approximately 55 exclamation points. Of course I was in. The day finally arrived yesterday. I showed up at the gym’s Market Street location for the class. It was supposed to be a demonstration for the media, so when I found out that we would be doing a slightly abridged version of the 50-minute workout, I was a little sad. I made a mental note to come back for the full class later. 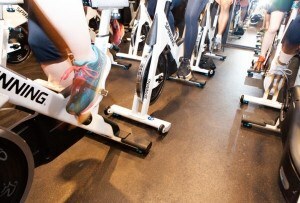 The class is modeled after the gym’s new Ultimate Fitness Experience (UFX) series, which is PSC’s version of cross fit. The Train Like a Tribute workout was the brainchild of a New York Sports Clubs trainer named Eric Salvador, who read The Hunger Games and realized he could adapt UFX to incorporate its themes. The result is a competition-style circuit workout where 10 to 12 participants become Panem tributes for an hour, and are competing to make it through a circuit the fastest and win the Hunger Games. The aerobics studio becomes the Arena, a pile of fitness equipment (free weights, mats, even a plastic bow a la Katniss Everdeen) becomes the Cornucopia, and the trainer becomes the Gamemaker. The circuit entails five moves: Katniss Killers for archery (tributes use bows to work arms, doing 10 pull-backs on each side); Capitol Crunches for tree climbing (lying flat on their backs with legs extended, tributes hold a weight plate above their heads and come to a full sit-up, repeating 10 times); Jabberjay Jacks for speed and agility (tributes perform 20 cross-legged jumping jacks); Peeta Presses for strength (tributes do 10 squat presses with eight-pound weights); and a sprint around the arena. When you return to your station you repeat the circuit, tracking how many circuits you’ve completed by stacking cones. Thrown into the mix are disasters inflicted by the Gamemaker. When the music stops (the soundtrack is awesome, by the way), the Gamemaker comes over the loudspeaker and tells you about a new development in the arena. Tributes have to return to the Cornucopia and perform a new exercise. When it’s completed, they go back to their stations and pick up where they left off. In our abridged version of the workout, we managed to complete between five and six circuits and made it through one Gamemaker disaster; I’m told that in the longer version, tributes will complete seven to eight circuits and endure up to three disasters. When I read through the circuit exercises before we started, I didn’t think it sounded too difficult. But by the time I’d completed two, I knew I was wrong. My shoulders ached from the squat presses, and that dang bow was much more taxing than I’d realized. I was dripping sweat by the end. There was one tribute who took an early lead, but he burned through his energy quickly and fell behind. Because the workout was shortened, we didn’t really declare a winner (though I’m pretty sure I was in the lead—just sayin’) but I’m told that in the usual workout they have a little winner’s ceremony at the end. Overall the workout was really fun, surprisingly tiring and mentally engaging. It’s bootcamp style—as in, the trainers crouch next to you and holler at you to go faster and push harder—but that totally appeals to my competitive side. Plus, the Hunger Games tie-in totally speaks to my inner teen-lit book nerd. Can I get an amen? 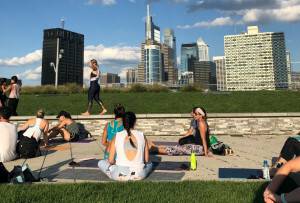 Here’s the best part: Philadelphia Sports Clubs will offer the class through the end of April free of charge for members and nonmembers alike. It’ll take place every Wednesday evening at 6:30 p.m. at the Market Street gym. 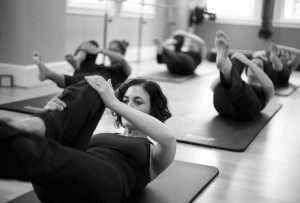 Next week’s kick-off session on the 28th will be first-come, first-served, but depending on demand, the gym may opt to offer an advance sign-up sheet for future sessions. Philly, welcome to the Hunger Games.